Women are Angels. And when someone breaks our wings......... we simply continue to fly ........ on a broomstick. We are flexible like that. OKAY? Sure don't but that is very pretty. seems like it might not be too hard to just .. duplicate in your own fabrics.. just saying.. Here today... why what a lucky bunch we are. Elisabrat is pretty smart. It looks like various sampler blocks and then doing sunflower applique over it would finish it up. Not sure but you can do it on your own. I so not know but, should be able to do your own. Thanks everyone. You are right, with some thought I should be able to make it up on my own. I think I might give it a try. Good for you. Too many are afraid to 'wing it'. It looks like a sampler, but more organized or repeated blocks? If you look at each 'column', there seems to be 3 - 4 solid squares, one 4 patch and a star block and 16 patch mixed in. Then the flowers appliqued over everything. It's a very pretty quilt! I love quilting - it's cheaper than therapy! I don't know. 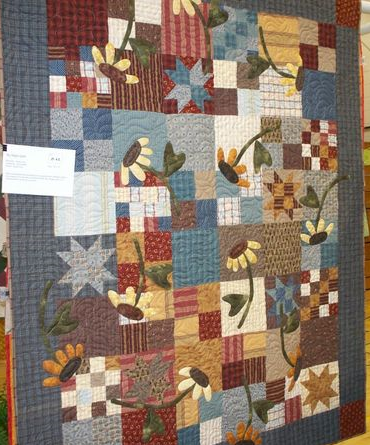 Beautiful quilt. Good luck. it's important that when you save pictures of other people's work, that you save the information about where the picture came from. Don't know the name of it...but know that I like it! I love having pieced backgrounds and then doing applique over it. I have done Yellow Brick Road that way...did in autumn colors, then appliqued leaves and acorns. I dont think I have seen this before, but somehow my brain came up with BuggyBarn. I checked their site and it does look like something they would have a pattern for. I am still poking around there, but you might send them the picture and ask if they recognize it. Thank you, I will have a look around the Buggy Barn site.